So, Saturday we had some of the guys coming over to get the boat summer ready. My SIL said she wanted to bring the twins over (two in the middle), at the same time as a friend of mine asked if I could babysit for her (the one on the left). So, I called baby on the right’s mom to bring him over, too. It was great fun! At one point, they all cried at the same time. We couldn’t stop laughing!! Poor babies!! It is funny to think that these are all the products of the trio of pregnancies that were so hard for me to deal with. 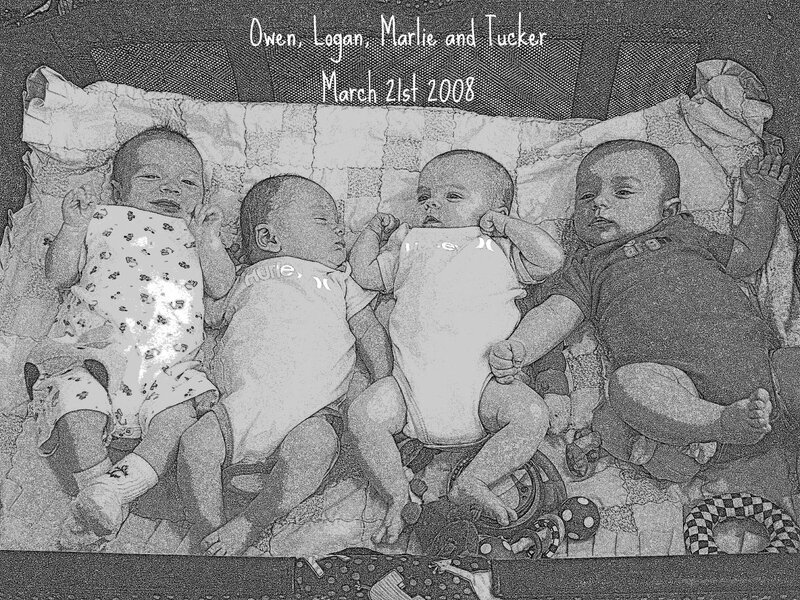 I love all these kids, and it is strange how all of those feelings I had with the pregnancies all just melt away when those giant bellies turn into actual babies. ~I was babysitting my friends’ baby when my SIL arrived and I realized I would have rather been snuggling with my niece of nephew… It made me feel very badly for feeling that way, but it also made me feel very connected to my niece and nephew. It feels awesome that we will have that bond…strictly becuase we are related (and not by blood!!). ~Captain did fantastic with all the babies! Baby on the right’s mom put him on the floor first thing and let captain lick all over him. Baby even giggled a little! It was so cute! I think letting him lick and explore the baby reduced his curiosity, becuase after that, all the babies hung out on the floor, and other than a toe lick or two, he just watched them. At one point, he even started doing his cuddly, rolly thing he does when he gets a new toy he loves, or after I rub behing his ears. I always call it his love roll and he was doing it next to all the babies. He loves them! It made me so happy and I was so proud of him. I think he will have very little trouble adjusting when our little one comes. The only thing was that he seems to be in love with the soothies! He stole them five times, and we had two soothie casualties. I think he was just waiting for them to drop them out of their mouths to attack! Anyway, here is the finished product. The nursery is really, really cute! Nice job. Nursery is so cute!yes, I have a hard time w/ the pregnancies of others while once they have their babies I’m fine and love the babies and are happy they’re here. I love the nursery. And if you want to just paint over the giraffes as the little one grows you can still keep the rest the same. I love the stripes on the bottom half. Oh how I wish I could paint a nursery. are you on crack???? don’t paint over the nursery!!! it looks amazing!!! the one thing that we were really aware of with our dog when the boys came home was to make sure that he still got lots of attention, positive re-inforcement and his walks. it’s been 8 months and still no problems! he even has started letting out a couple of barks when someone comes to the door – full protective mode. he NEVER barked before the babies came home. there’s nothing like a kid and their dog! OH, I LOVE it!!! I wouldn’t change a thing. My mom did a mural in my daughter’s nursery- we have since moved and I miss the mural and hope that they new owners haven’t painted over it! I think the nursery is fabulous and hope it will soon be complete with baby!Glad you enjoyed the babysitting and that Captain did so well with the kiddos!